Last weekend saw the return of the J24 fleet to Cork Harbour for the North Sails sponsored J24 Southern Championship 2015. In this two day event the world’s most popular one-design keelboat will test the often unpredictable waters of the second deepest natural harbour in the world. Among the competitors we will see the current and three times national champion Flor O’Driscoll battle with the young guns from Howth Yacht Club fresh from last week’s top ten finish in the “Le Crouesty” J24 Europeans. 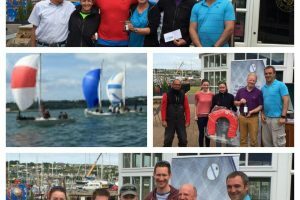 Local interests include a Under 25’s RCYC team skippered by Patrick Crosbie, Conor Haughton’s Maritime College team and Dave Lane & Sinead Enright’s YaGottaWanna. It has been more than 15 years since the J24 class has held a championships here in the RCYC and we are delighted to Have them back. Saturday morning South of Roche’s Point saw a breeze of 18 to 20 knots for the first race of the J24 Southern Championship. Race Officer Ciaran McSweeney kept everybody on their toes, sounding the first gun at 10.30 as posted, catching a few competitors off guard. JP McCaldin and his crew on Jamais Encore dominated the first race with local boat YaGottaWanna showing good boat speed to claim a second place. Current Irish Champion FlorO’Driscoll claimed third place with Patrick Crosbie helming his youth team over the line ahead of the Howth Yacht Club under 25 crew. The battle of the start line was more intense in race 2, with Howth Yacht Club and Jamais Encore stealing a march on the fleet on the first upwind leg of the windward / leeward course. The first run saw Flor O’Driscoll joining the early leaders, engaging in a duel up the next beat with HYC. The finishing places confirmed the credentials of gold fleet, with Jamais Encore, HYC and Hard on Port taking the podium. The breeze was building by the start of race 3, and the local youth team changed from the overlapping genoa to a jib, a decision which proved to be inspired, as we watched them make their way up the racecourse, to finish close on the heels of the gold fleet boats. All the competitors followed suit with the foresail change for the last race of the day, in challenging gusty conditions. An unfortunate collission in race 4 between HYC and YaGottaWanna resulted in HYC retiring, and YaGottaWanna limping home with a hole in her aft quarter. 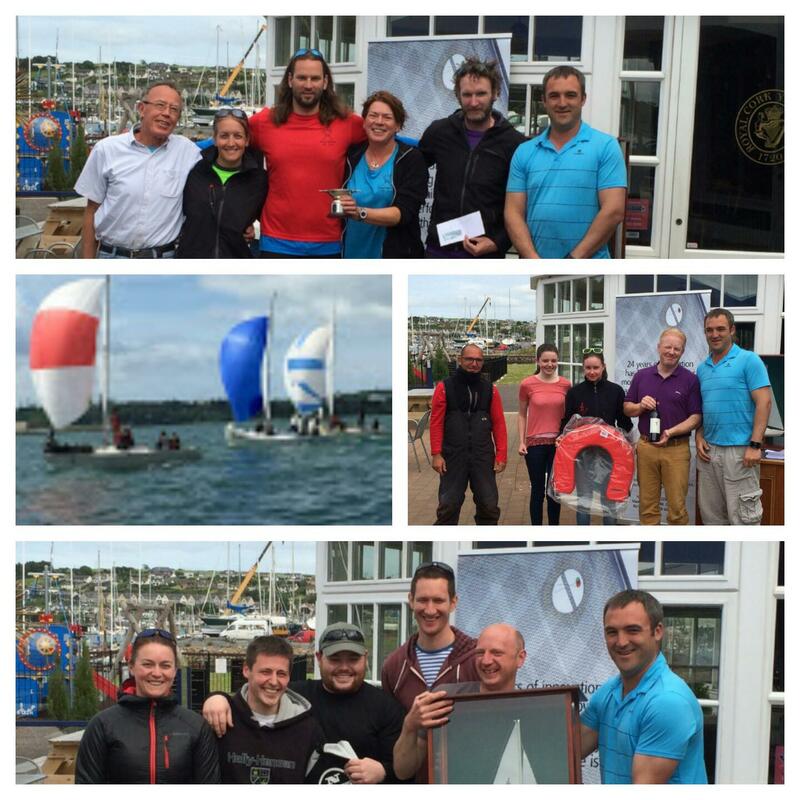 Conor Haughton’s team from the National Maritime College kept the local spirits high, with a 4th place finish. The breeze held for the second day of racing with the race officer deciding to move the fleet to Cuskinny in the hopes of a flatter sea. All competitors opted for a jib for the first race with heavy gusts funneling up towards east ferry. Jamais Encore maintained her winning ways, bagging a third place to add to her 4 bullets in the 6 race series, and opting to withdraw from the last race to expedite hauling out, ready for the long road home to Lough Erne. Tide became more of a prominent force in the lulls for race 6 with some boats opting to be brave and changing back to a genoa. HYC pulled out a sizeable lead on the first downwind leg only to see the lion’s share of it disappear on the second beat. Another entanglement between HYC and YaGottaWanna at the leeward mark saw positions change again. Jelignite claimed their first bullet in a regional championship, a fantastic result for Finbar Ryan, and the young girls on his crew. The crews sailed back to Crosshaven, passing the magnificent display of the Traditional Sail Fleet bathed in the sunlight of our harbour. After hauling out, all competitors enjoyed the hospitality of the club, and showed their appreciation of Kieran O’Connell for his hard work in providing a brilliantly run championship. We hope it will be an annual event here in RCYC. JP.McCaldin expressed his enjoyment of the event and the beauty of the harbour, while accepting his First Prize in gold fleet and overall J24 Southern Champion, wondering why it had taken him so long to race in RCYC. Hard on Port claimed second overall, with HYC completing the honours in the gold fleet. Local boat YaGottaWanna were delighted with their first place in silver fleet, and were highly impressed by the performance of the local youth team in a very tweaky unfamiliar boat. We look forward to seeing the J24 fleet back in Cork Harbour on a regular basis.